It's possible to upload files for staff and clients to download through their dashboard. This can come in handy if you have staff sign a contract agreement or if you use a vet release form for clients. You can access the document section for staff in Staff -> Documents and for clients in Clients -> Documents. Global Documents are documents that you upload once and are available to all of your clients or staff. The documents can be accessed and downloaded through the client portal or the staff's dashboard. You can also delete any global document that has been uploaded by selecting the "Delete Document" text. 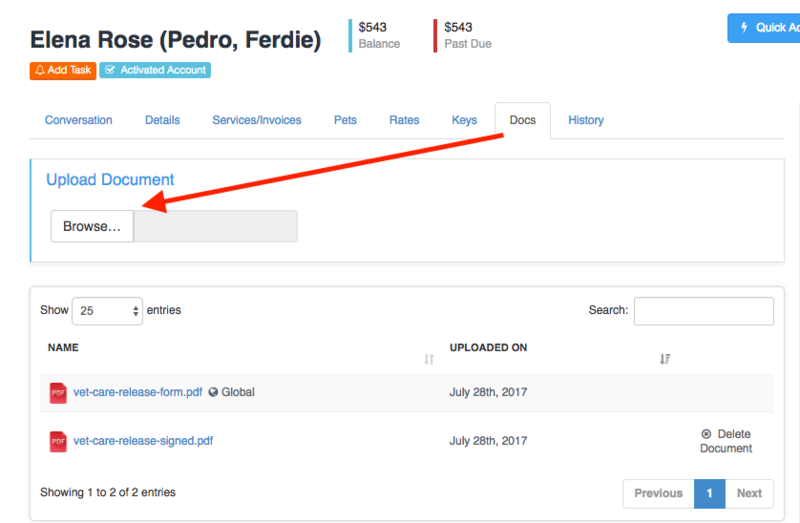 It's possible to upload a document for a specific client or staff by going to their profile view and selecting the "Docs" tab. This will only be accessible for that staff/client. If a staff member has access to a client's profile, they will be able to download any document that has been uploaded to the client's account. This is very important in emergency situations when the staff needs access to any documents.